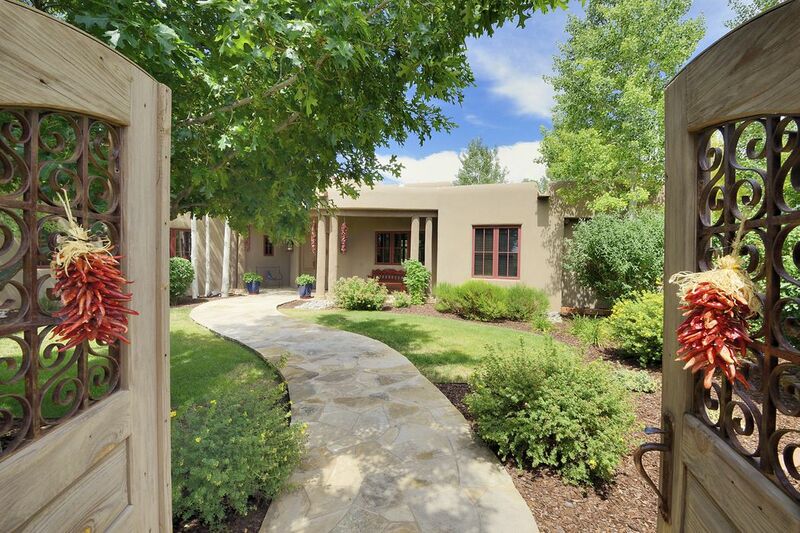 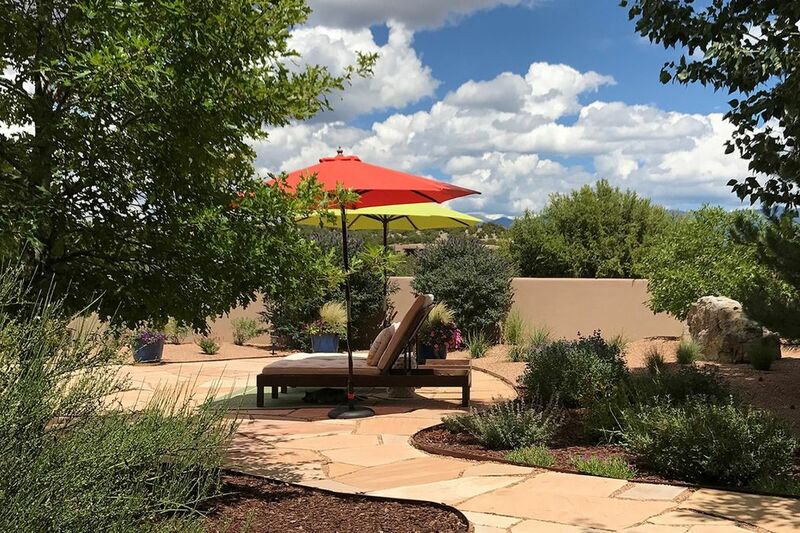 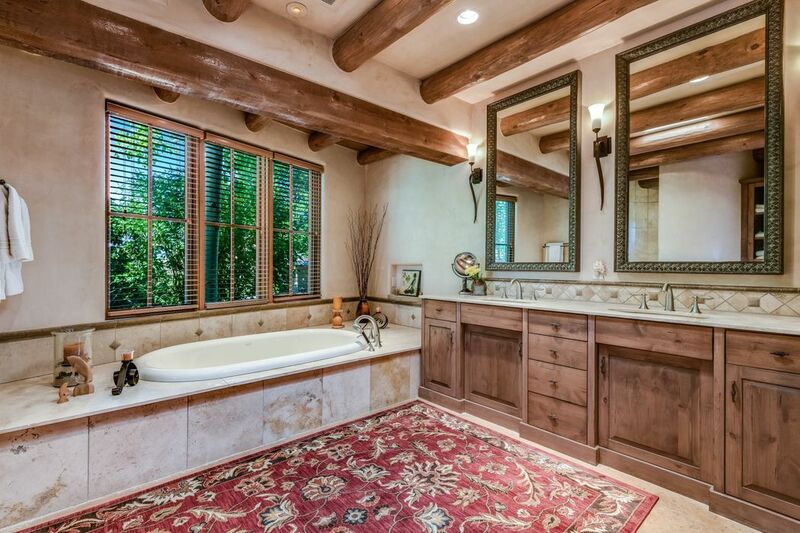 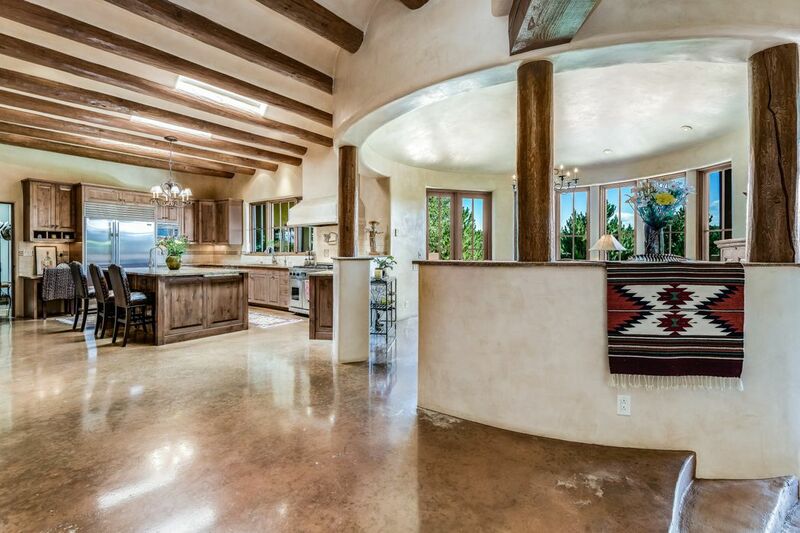 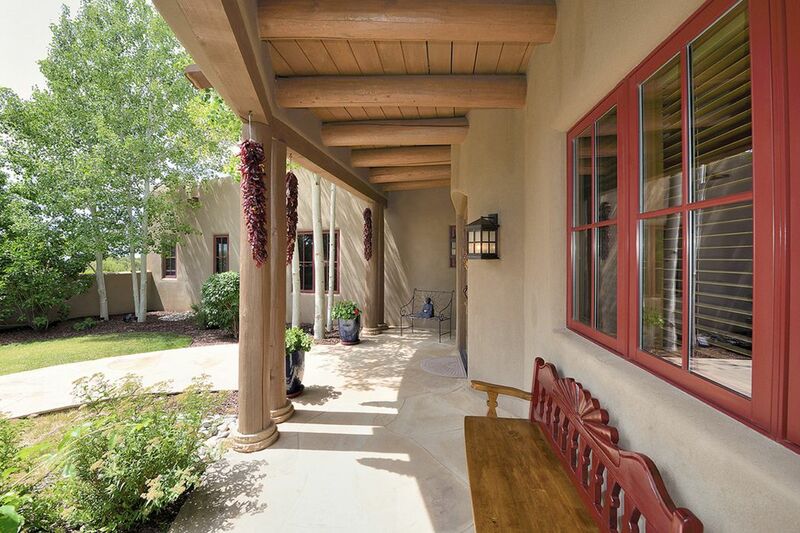 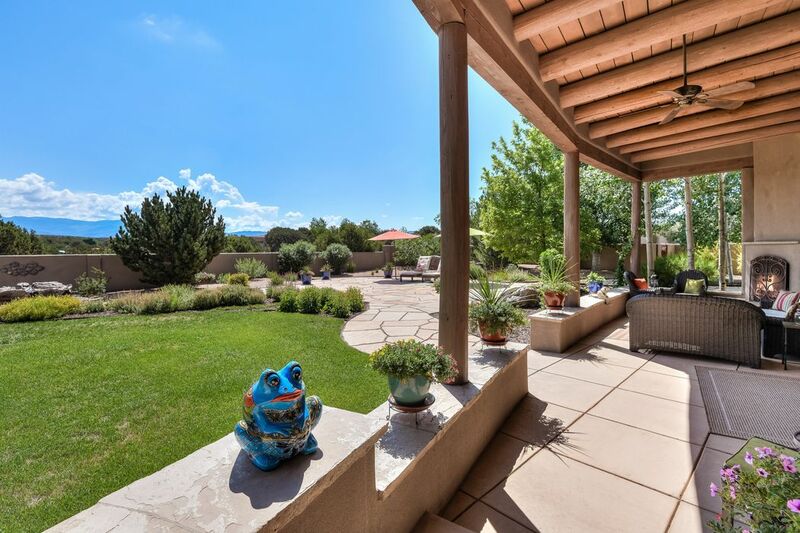 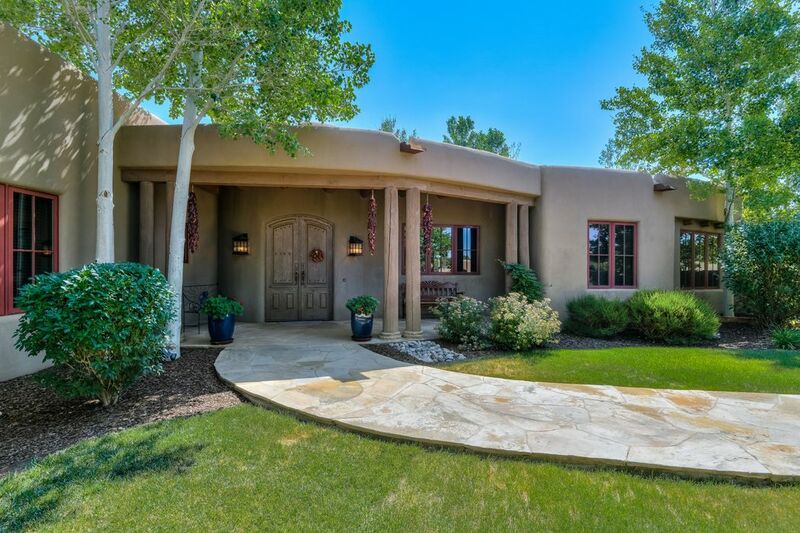 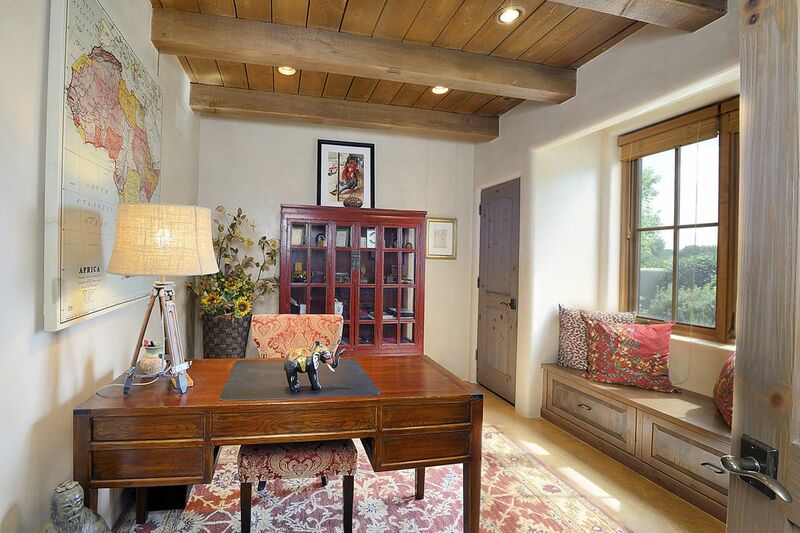 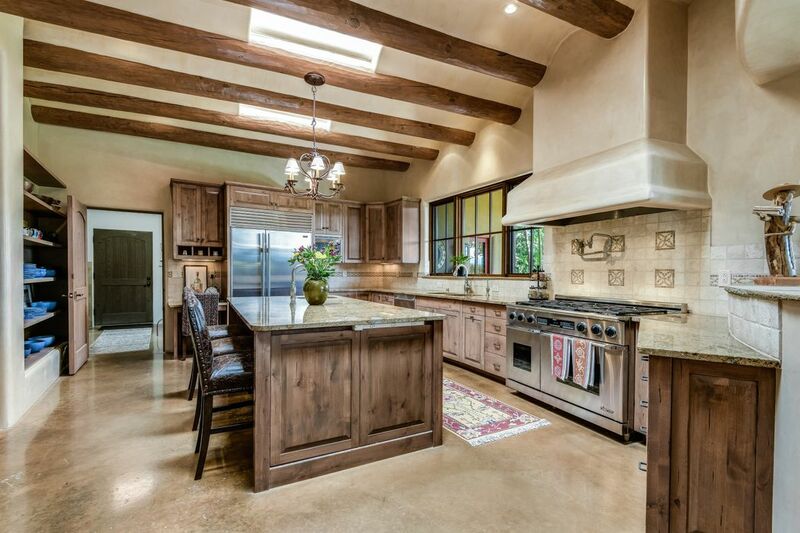 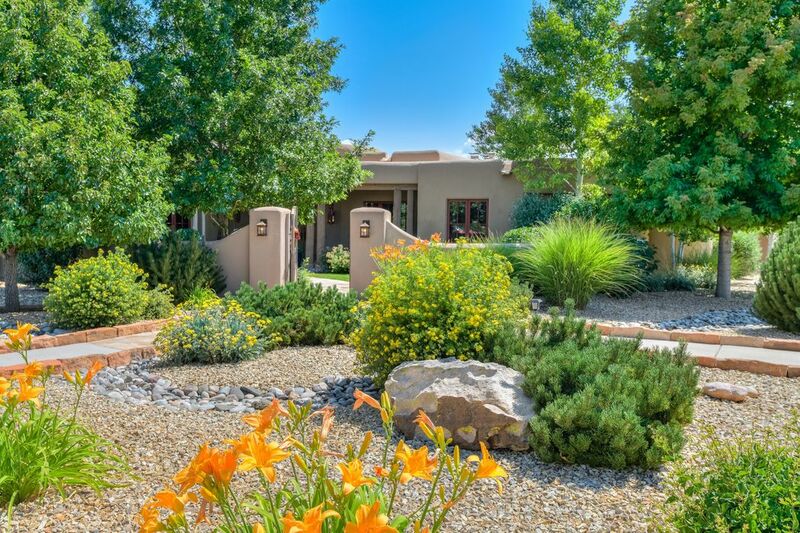 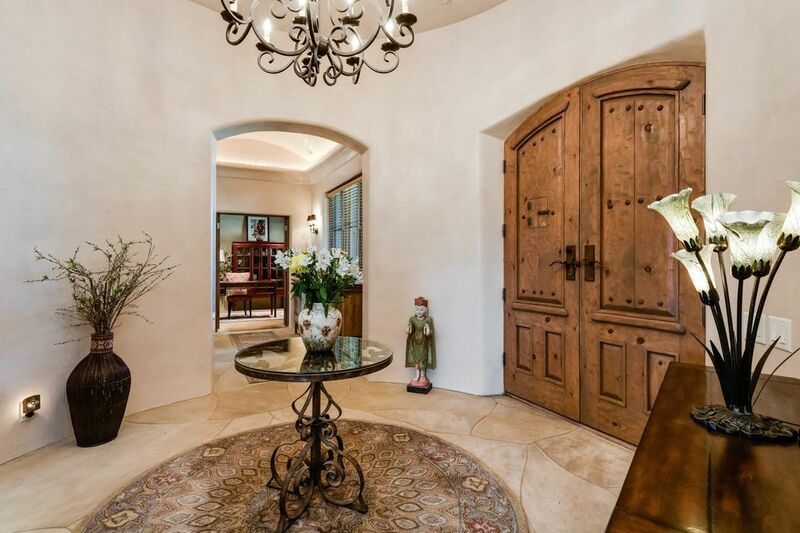 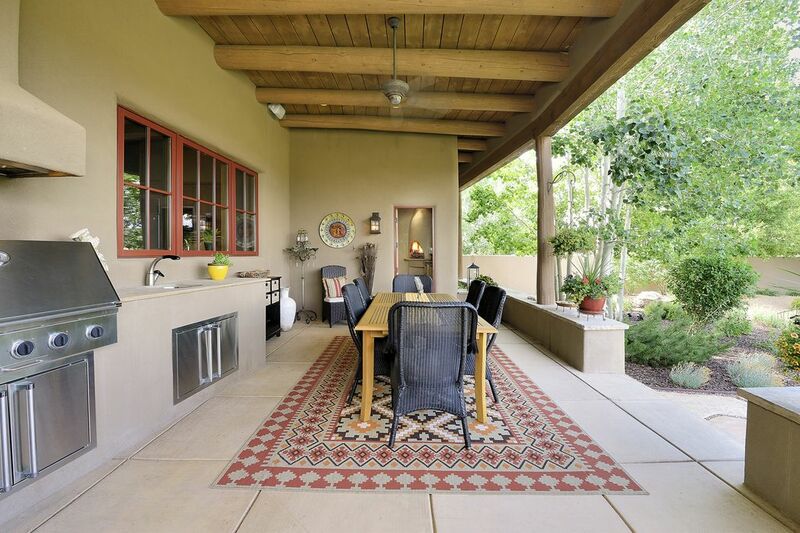 17b Paseo Del Oso , Santa Fe, NM 87506 | Sotheby's International Realty, Inc.
$1,450,000 4 Bedrooms4 Full / 1 Partial Baths4,200 sq. 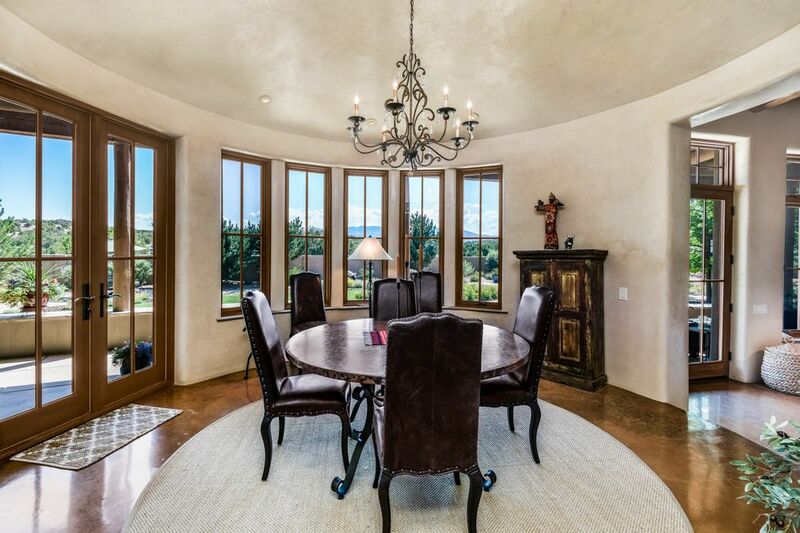 ft.
A dramatic rotunda dining room sets the elegant tone for this 3 bedroom, 4 bath home of 4000 sq ft with 1 bedroom, 1 bath guest house set on 3.5 acres in Tierra Preciosa. 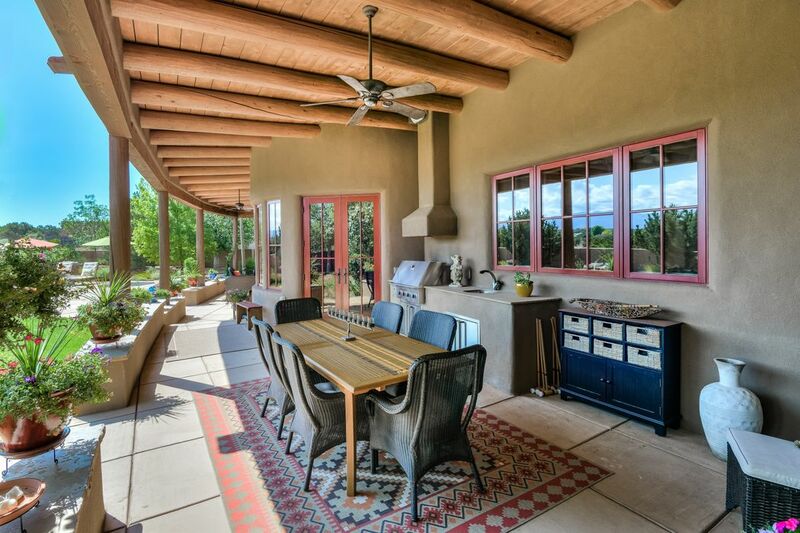 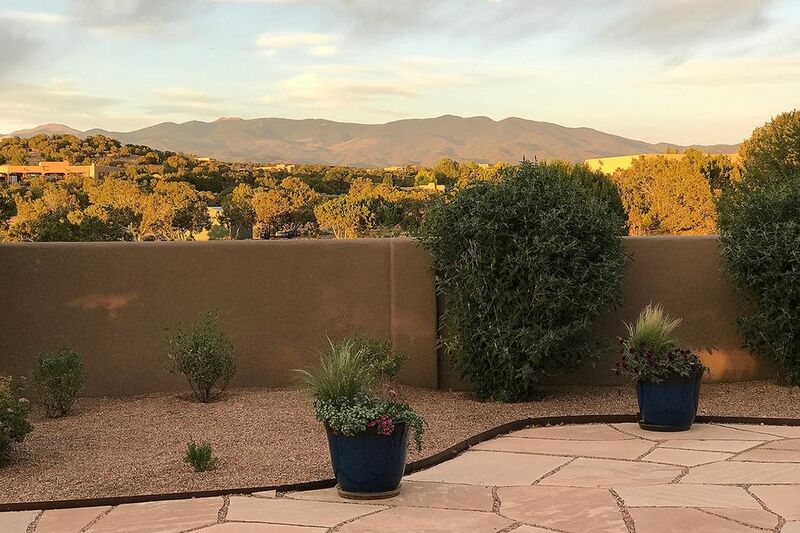 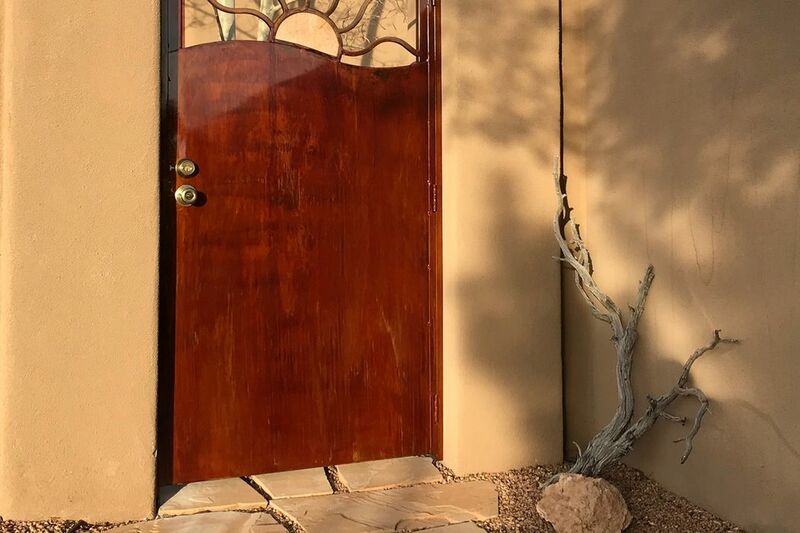 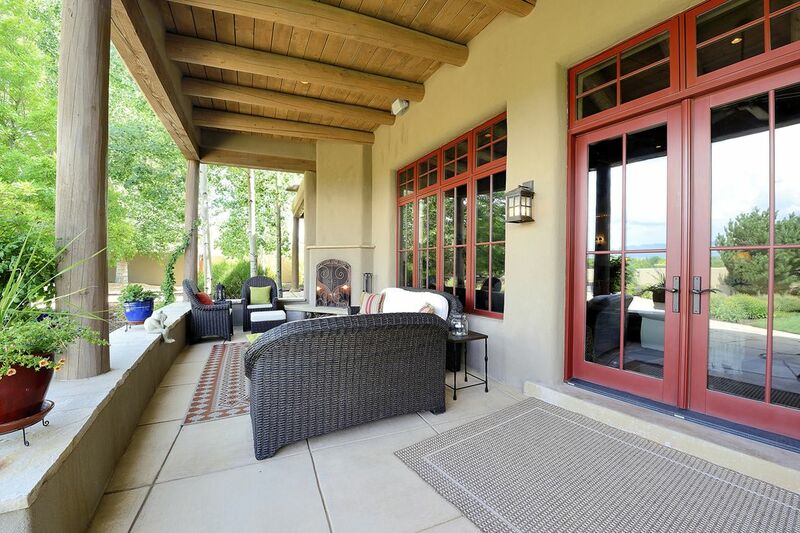 The front entrance patio is strategically positioned for watching the beautiful New Mexico sunsets. 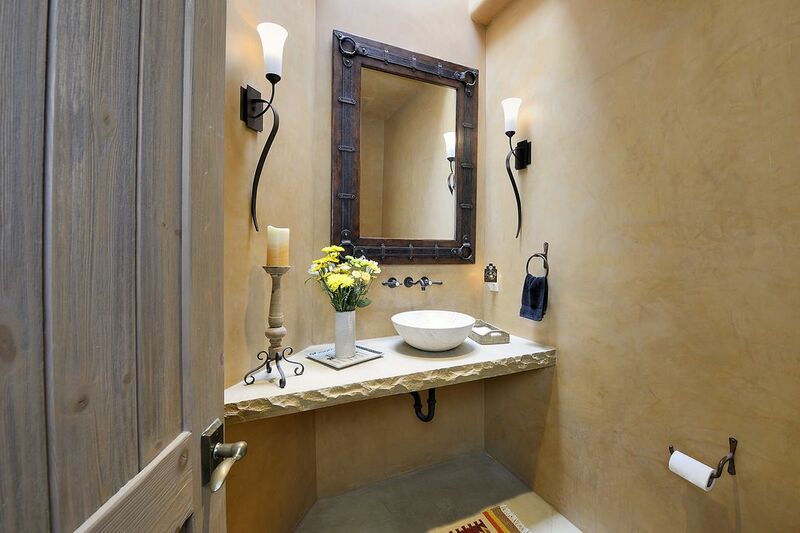 A mixture of textures from sleek stone and natural wood enhance the design. 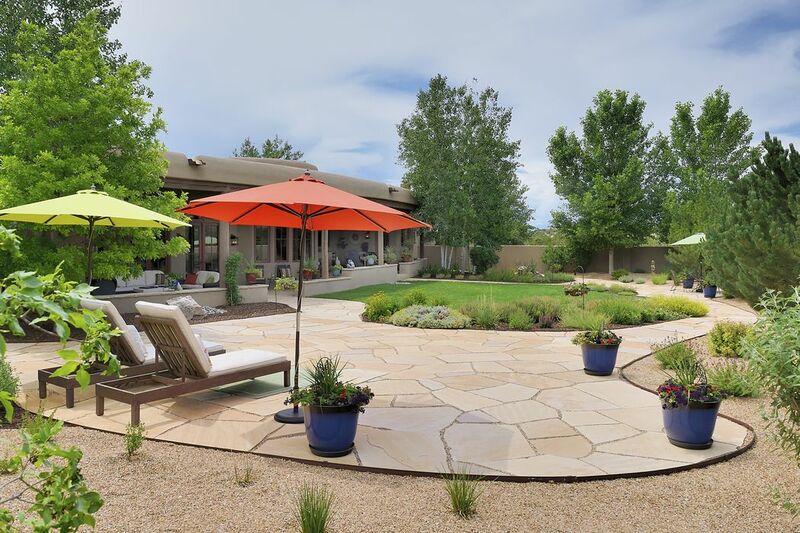 Large flagstone portal opens onto a backyard abundant with flowering plants and shrubs with an outdoor kitchen and fireplace that lets you entertain in style and comfort. 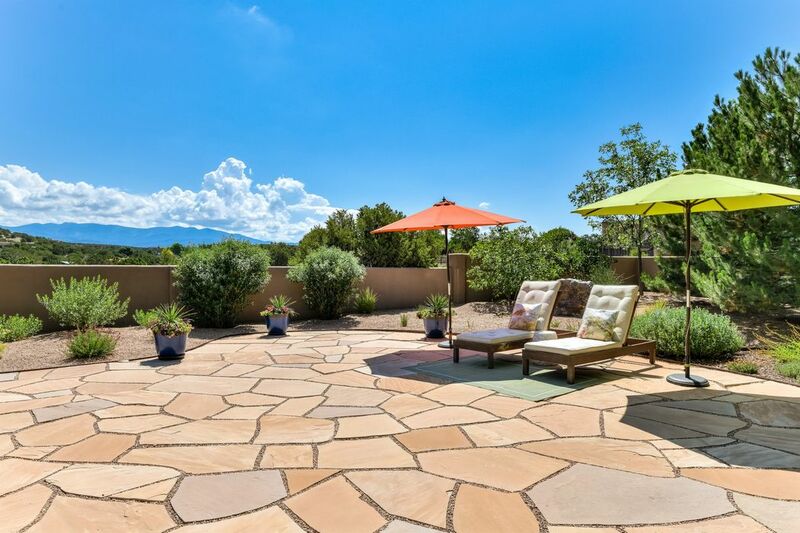 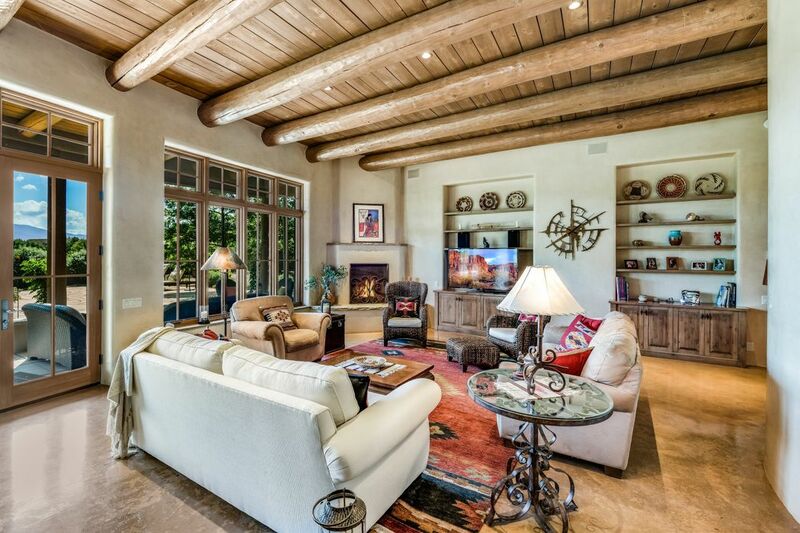 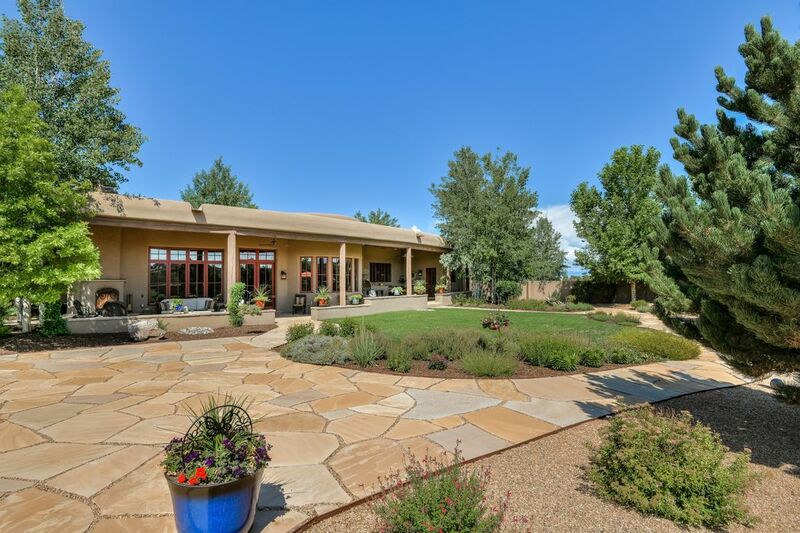 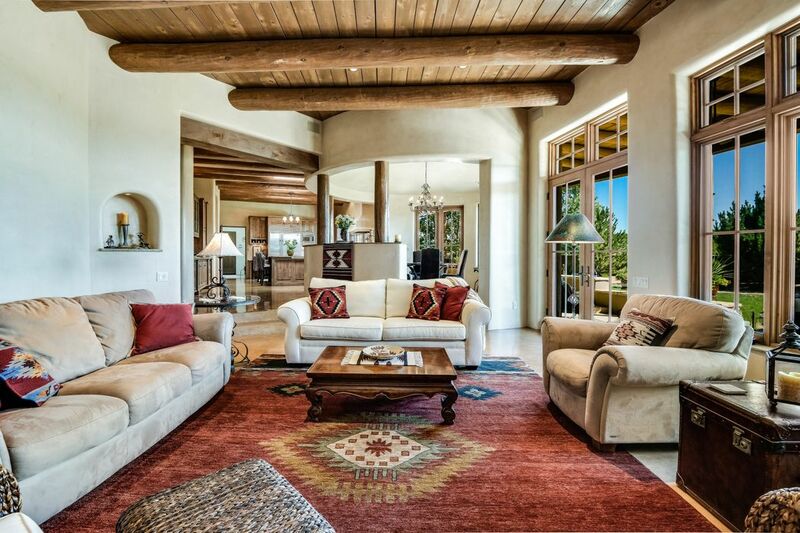 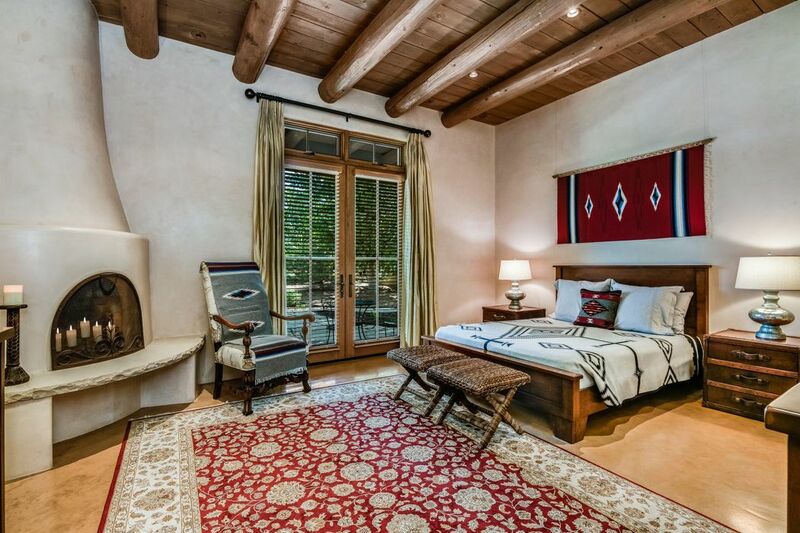 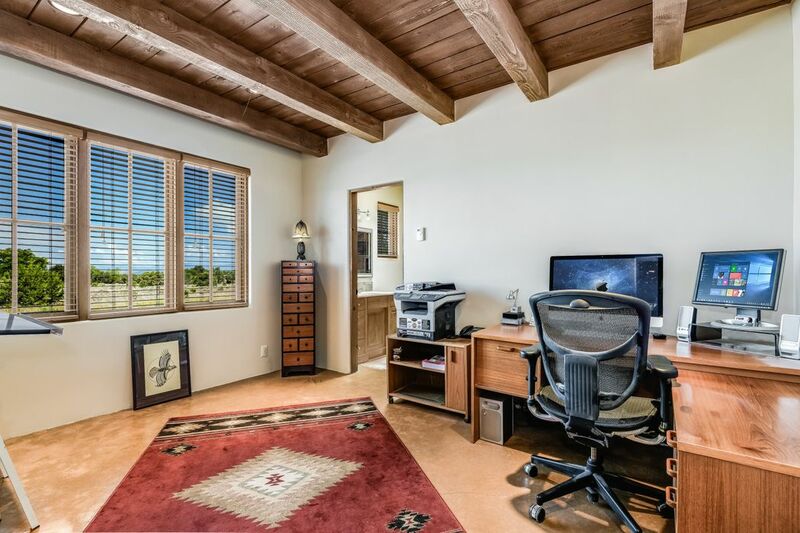 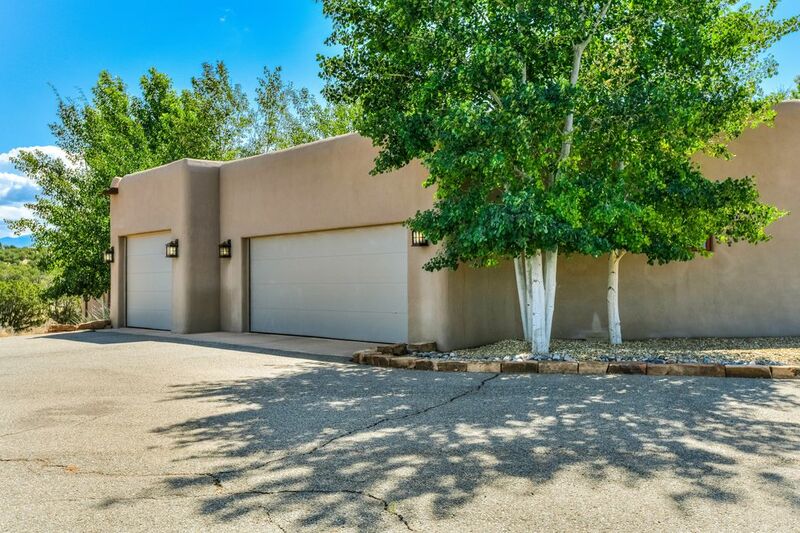 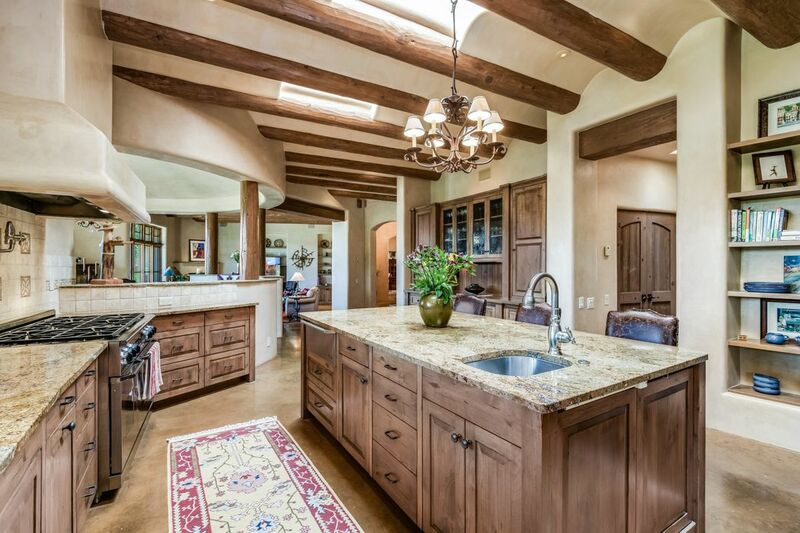 Magnificent views of the Sangre de Cristo mountains add to the appeal. 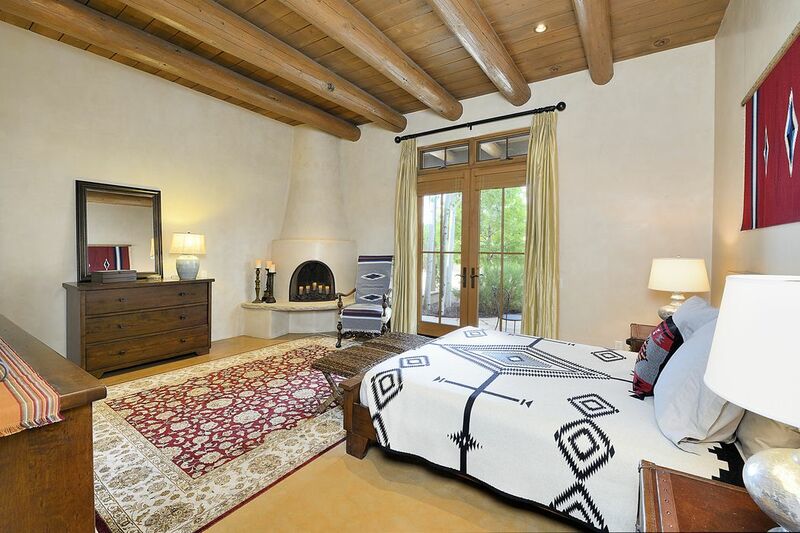 Fireplaces in the living room and master bedroom, vigas and beams throughout bring an ambiance that is sure to impress. 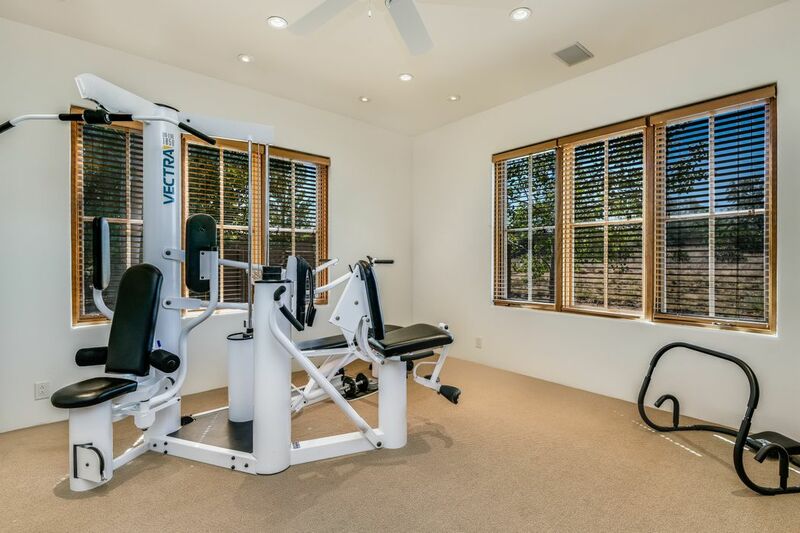 There’s an office and exercise room off the master bedroom. 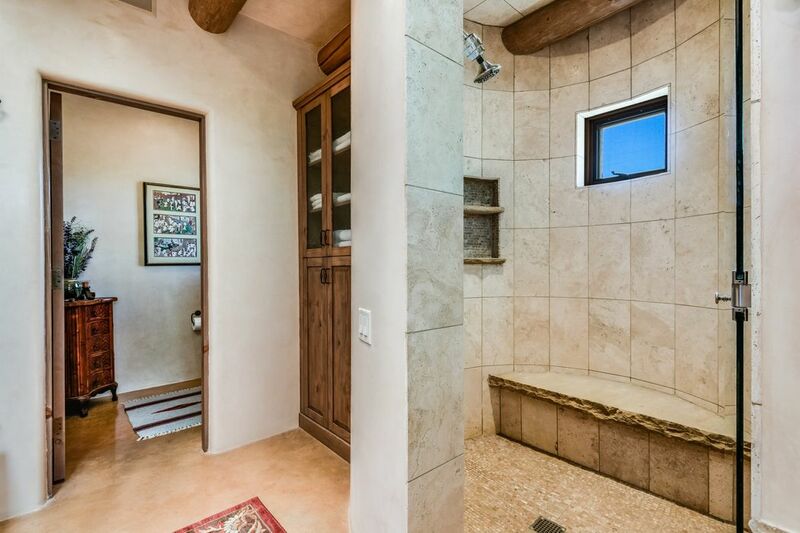 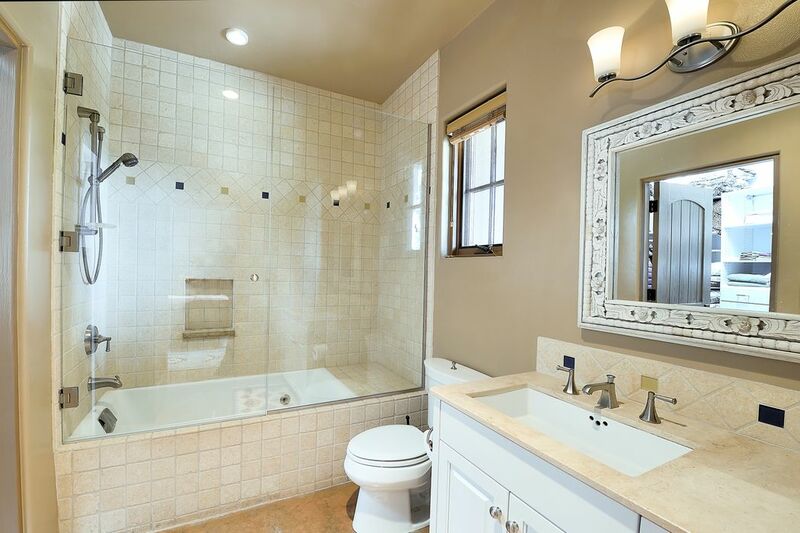 And the 3/4 bath has a steam shower. 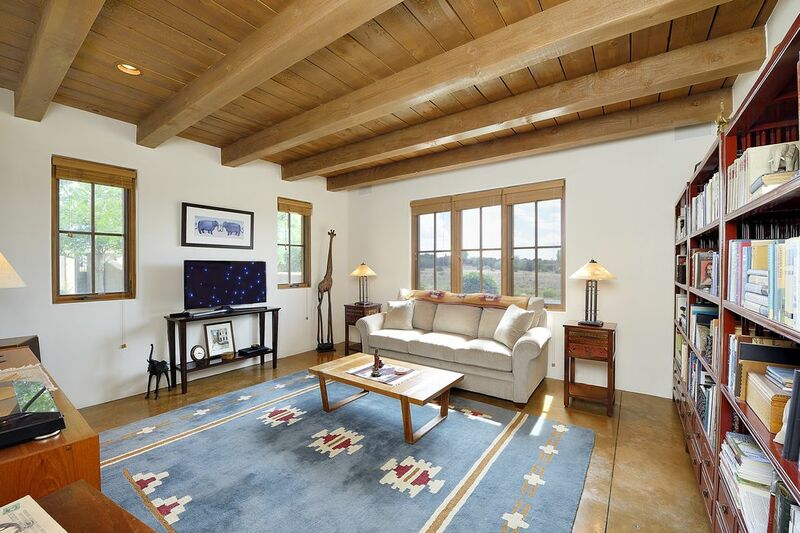 Radiant in-floor heat and central A/C make for comfort year-round. 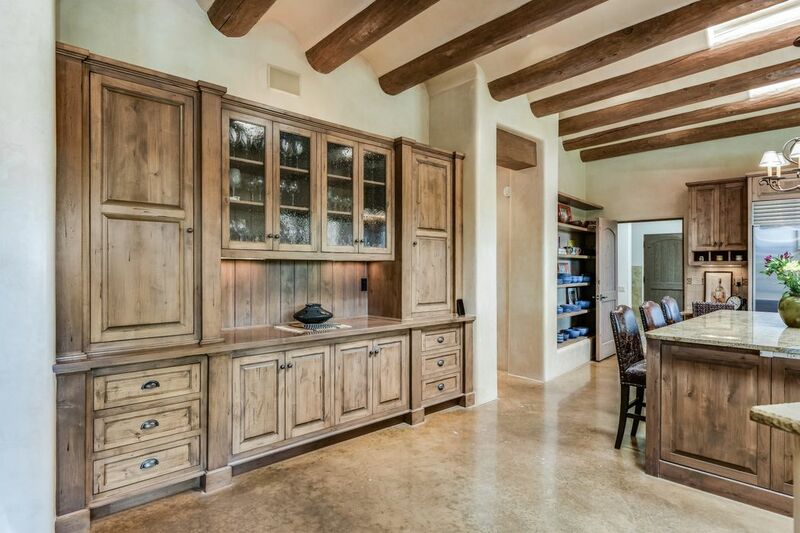 Spacious kitchen with a full complement of high-end appliances and built-in hutch makes hosting a delight. 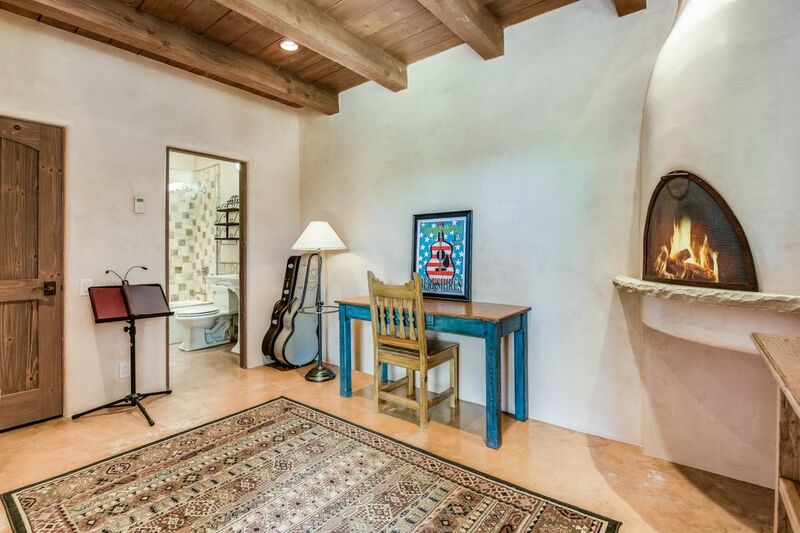 A guest house with full bath and kiva fireplace will graciously welcome company, or make a very nice work-at-home space. 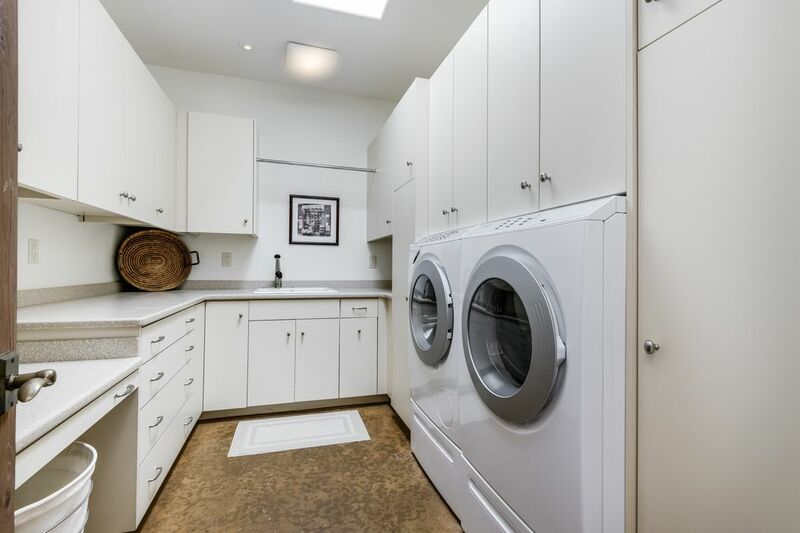 Three-car garage, a well-equipped laundry room with plenty of cabinets and sink, a security system and stereo speakers throughout make for easy living. 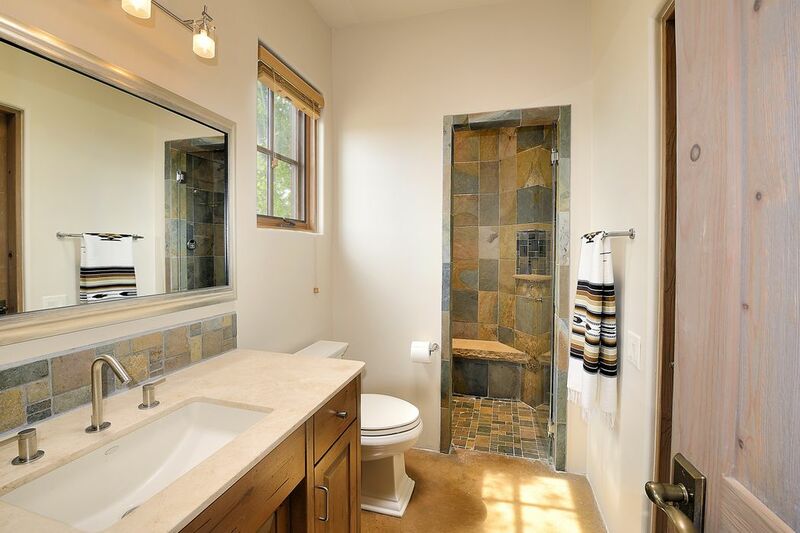 Many upgrades and improvements, too many to list, add value and peace of mind including a new roof in 2016. 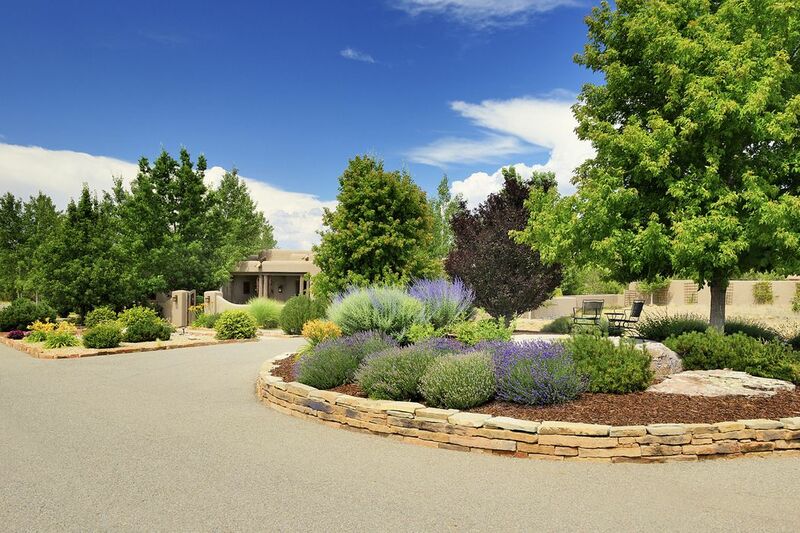 There are no HOA dues, and road upkeep is done by a neighborhood group with fees depending on road condition and based on acreage.